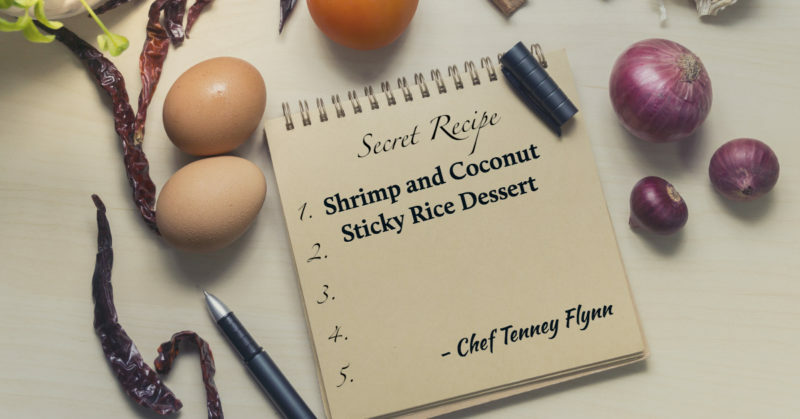 Editor’s note: This recipe is from Wild American Shrimp Chef of the Year 2018, Tenney Flynn’s upcoming cookbook being released in Spring 2019. No pictures yet but we have this specially released recipe to share. Enjoy! Bring coconut cream, coconut sugar, salt and Pandan leaf to a simmer in a small saucepan. Simmer uncovered for 5 minutes and remove from the heat. Finely mince the dried shrimp, garlic, peppercorns and whole chile with the cilantro roots. If you have a mortar and pestle, this is the traditional method for grinding these ingredients. (This amount is too small for a food processor.) If not, chop everything else as finely as you can on a cutting board. Grate the coconut, if using fresh. Sauté the chile and cilantro root mixture in the coconut oil on medium heat until you smell the fragrance of the garlic. Stir in the coconut. Stir in the diced raw shrimp and continue to cook for a few more minutes, stirring until the shrimp changes color. Stir in the red coloring and mix until it is a uniform orange. Keep stirring while adding the salt and sugar (if using sweetened coconut reduce the sugar by half). Stir in the finely shredded Kafir lime leaves and remove from the heat. Place in bowl and set aside covered at room temperature. Cook the rice: Place rice in a large bowl and rinse with warm water until the water turns clear. Let it soak for a few minutes and drain in a colander or sieve. Measure the 2-1/4 cups water into a medium-size, heavy pot with a tight-fitting lid. Add rice, cover, and bring to a boil. Reduce to a simmer and cook for about 15 minutes until all water is absorbed. To check absorption without removing the lid, shake the pot and listen for any sloshing liquid. When all water seems to be absorbed, turn off the heat and let it sit covered for 10 minutes to steam. Remove the Pandan leaf and mix the coconut cream with the hot sticky rice until it’s incorporated. Cover it and keep at room temperature. To serve, scoop the warm sticky rice on to a banana leaf square and top with a spoonful of the coconut shrimp. Learn more about Chef Flynn here and check out his restaurant, GW Fins in New Orleans, LA.